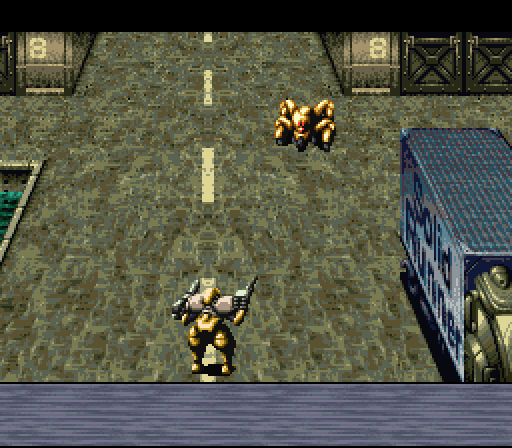 Solid Runner came out in 1997, and was a late game in the SNES lifespan. It was developed by Sting, and published by ASCII. The graphics are quite nice in the game, and there’s a number of subtle fancy details. For example, the very first house in the game has double doors, and each door opens (and swings shut) depending on how you touch them. 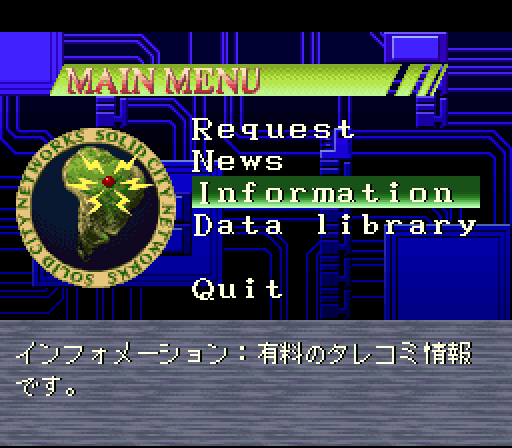 Looking online, several Japanese commentators said that the game was gorgeous. The internet of the far future is apparently a bulletin board like system. A very nice touch is that read messages vanish from the list. Plotwise, the game is a basic dark future. The hero, Shuu, explores Solid City which is overrun with crime. As best I can tell, your first mission is to try to save Nora from kidnappers. You start out by getting a message from her, and then a phone call from a friend who is a nun. 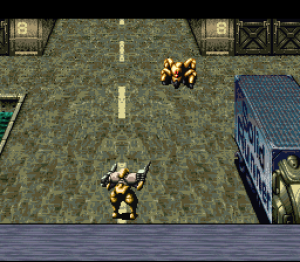 After checking out Nora’s house, you get a call from the kidnappers, and then head out in your mobile suit. 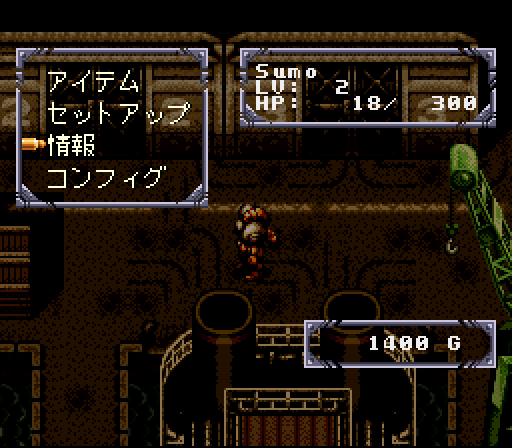 The battle system is very minimalistic, and mostly you just get some damage numbers, and text at the bottom of the screen. Unfortunately, I fought three battles and promptly was killed by the fourth. 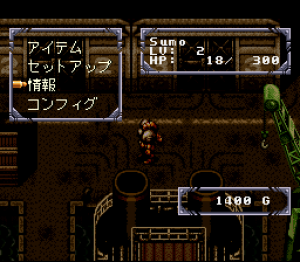 As best I could tell, I had updated my guns, and had HP recovery armor equipped on my robot. Did I not know how to battle correctly? The battle system had very few menus, and seemed to have some real time dodging elements. One Japanese commentator said that the game had a high difficulty level. Perhaps I needed to grind more carefully. Without a better understanding of how the game is meant to be played, it’s really hard to say more about it. After three battles near the warehouse Cargo-1, the hero is down to 18 HP. What I can say is that the production values of the game are very high. While I don’t love all the sprite work, you get multiple expressions on the hero, detailed graphics in town, and subtle details (like, say, light switches near doors.) Musically, the game reminds me of Front Mission 3 or Shadowrun – a sort of 80’s cyberpunk kind of sound. Unlike, say Shadowrun, you get a range of colors and areas, so the town feels more varied and vibrant to explore (although, it doesn’t really look like a town in the middle of a crime wave.) I suspect someone who hates fantasy themed RPGs would find the game to be very interesting. As it is, it’s a bit tough to explore due to the language barrier.